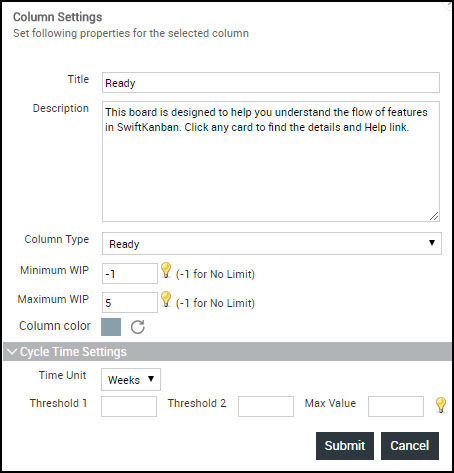 SwiftKanban provides a highly configurable Kanban board designer using which you can map your value streams in terms of lanes and columns of the board, define WIP limits for columns and track your work entirely using various features available on the Kanban board. When you create a new board, it comes with a default board configuration (as shown below), which can then be modified to suit your specific value stream. 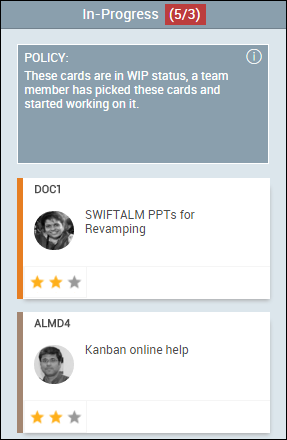 Note: SwiftKanban board comes with permanent URLs that can help you to access your board (login required, if the session is not active) and save you a few navigation clicks. You can bookmark your SwiftKanban board in your favorite browser to revisit directly. You can also share/enter these links in any external application, making cross-referencing easily possible. Note:Only users with ‘Manager’ role can modify the process, hence the Board Editor icon will not be available for users with ‘Member’ role.To modify the default process i.e. 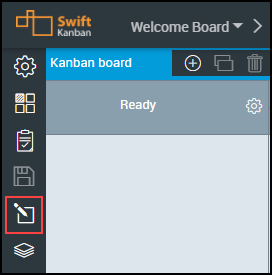 to define your own Kanban board, navigate to Kanban board and click the Board Editor icon. The default process is displayed in the Board Editor view. Change the workflow on the board by Configuring Columns. Add and enable Columns with same or different value streams. Define policies for card movement on the board. After you make any changes to the board layout, click the Save icon on the toolbar to save all changes. If you forget to save, you will see a prompt to ‘Save’, ensuring that no changes are lost, even by mistake. Tips: We have an exciting in-app Learning Enabler, called Challenges that would help you learn and configure your Board and collumns interactively. Please navigate to Help & Support > Challenges from the top level menu and try out the Challenges. To configure a column, click the Configure Column icon which is available for every column. The changes you make will apply to that particular column only. 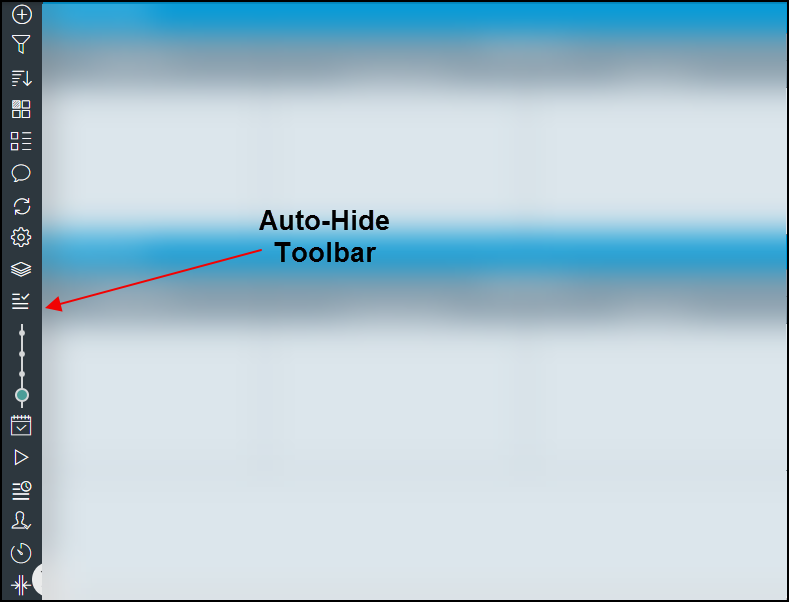 After you make changes, ensure that you click the Save button on the toolbar. 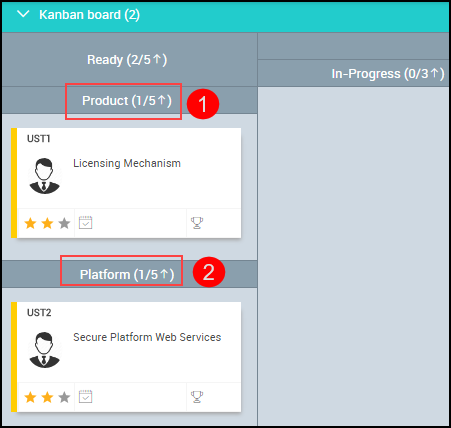 Subsequent to the changes, the Kanban board will display the modified columns. Horizontal Split: – This icon lets you split a column horizontally. Vertical Split: – This icon lets you split a column vertically. Move Left – This icon lets you move a column to the left position. The icon is not available for columns on the extreme left. Move Right – This icon lets you move a column to the right position of the selected column. The icon is not available for columns on the extreme right. Add to left: – This icon lets you add a new column on to the left position of the selected column. Add to right: – This icon lets you add a new column on to the right position of the selected column. Delete – This icon lets you unsplit/delete the selected column. If a column is deleted and it has live cards, the cards are shifted to the parent column and if no parent columns exist, the column is not allowed to be deleted. After you make a change to the workflow, ensure that you click the Save icon on the right side of the board to apply the changes when you return to the board. Thus with effect to the changes, when you pull a card to the board, the Add To list will display columns based on the new/modified columns. Add or rename the Column Title and description by clicking the column header, for example, ‘In-Progress’. You can even click the Configure Column icon and then click the icon. The Column Settings window appears where you can enter the new name in the Label box. Click Submit to save. The description that you enter for the column in this window is displayed on mouse hover on the column heading. Clicking on the header will let you place this description as a constant text in the same column. If a column has been split, the column description can be pinned only on sub columns and not on the parent column. Tips: We have an exciting in-app Learning Enabler, called Challenges that would help you learn and update the Column Type interactively. Please navigate to Help & Support > Challenges from the top level menu and try out the Challenges. Ready: Where you place the cards that are committed. In-Progress: Where cards are actively worked on. Completed and Waiting: Buffer column where cards are waiting to be pulled to the next column. Done: Last column where completed cards are placed. Change WIP Limit by clicking the Column header, or click the Configure Column icon and then click the icon . In the Column Settings window, you can now change the WIP Limit for the column. Click Submit to save. To turn off a WIP limit, enter ‘-1′ as the WIP limit. You can define a WIP limit for child columns which need not sum up to the WIP limit of the parent column. If your board manages multiple lanes on your board, you can set WIP limits for individual Column and child columns of each lane. Set the Cycle Time Threshold by clicking the Column header, or click the Configure Column icon and then click the icon . In the Column Settings window, click the Cycle Time Settings, then define two thresholds and a maximum value in hours, days or weeks for the column. Click Submit to save. If your board has multiple lanes, you can set cycle time settings for individual Column and child columns of each lane. Click the Cycle Time icon on the Side toolbar, it highlights the current status of the cards in a horizontal line based on the thresholds. Any card under threshold 1 is shown in green, in between threshold 1 and 2 in orange, and beyond threshold 2 in red. You can also filter cards based on the cycle time threshold that you have set for the particular columns. To know more about the threshold filter, see the Filter by Cycle Time Threshold section. 1.Click the Column header or click the Configure Column icon and then click icon. 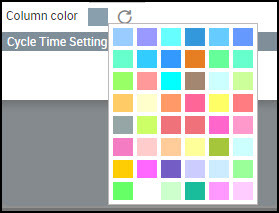 2.In the Column Settings window, click the square box of the Column Color and select a color. Note: Click the reset icon to switch to the default color. You may need a buffer column or a hands-off stage before/after a column. To add new columns, click the Configure icon of the required column. Select the Add to left icon to add a column before a column or select Add to right icon to add a column after a column. You can then rename the new column, add a description, define the column type, and the WIP limit by clicking the Column header, or clicking the Configure icon and then clicking the icon. Click Submit to save the column properties. 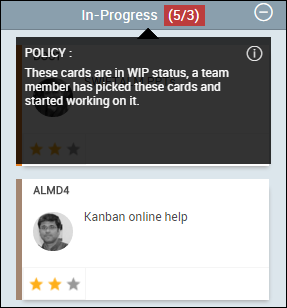 Adding a description for the column helps to identify the policy of the column (which displays on hovering over the column header) when cards need to be dropped on the board. You may need to split columns horizontally or vertically to create to indicate sub-processes. To create a horizontal split, click the Configure icon of the required column. 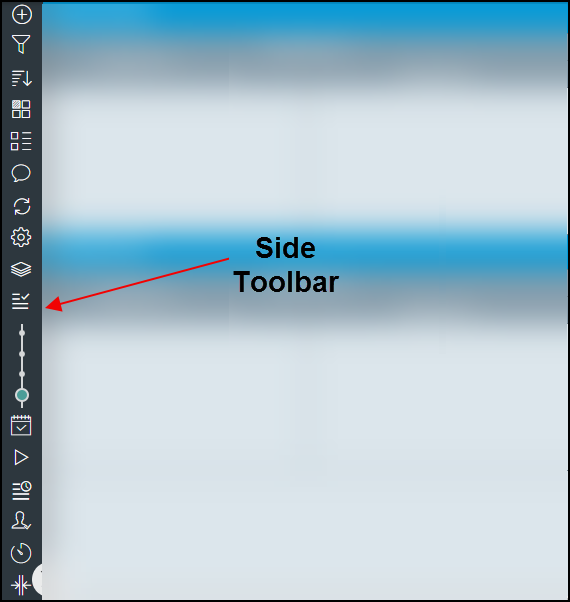 Select the Horizontal Split icon to create parallel sub-columns. To create a vertical split, click Vertical Split icon. You can move an existing column to the left or right of a column. To move a column to the left, click the Configure icon of the required column. From the toolbar, click the Move Left icon and to move a column to the right, click the Move Right icon. If there are live cards, they will move accordingly. You may want to remove a stage at some point in time i.e either delete a parent column completely or remove a child column. You cannot delete a column having cards on the board. However, if the column is divided into child columns and the child column has live cards on the board, you can delete the child column. The cards will be moved to the previous child column. To remove a column or merge a sub-column with the parent column, on your Kanban board click the Board Editor icon on the Side toolbar(see the Configuring Columns section), click the Configure icon of the required column, and then click the Delete icon. To save your action, click the Delete icon on the Side toolbar. To delete an unsplit column having live cards, move the cards to the previous column on the board and then delete the column. The master list cannot be added, you can modify values in the predefined master list of Reason Code for Risk, Issue and Block flags. 1.Navigate to Board > Board Editor, and click the Master Lists icon on the toolbar. The List of Master List page displays the existing Master Lists. 2.You can modify the values for the predefined Master List. You can define the card carousel to see card attributes you prefer to track on the card and in the order these should appear. Every board can have its own configuration on the card carousel. 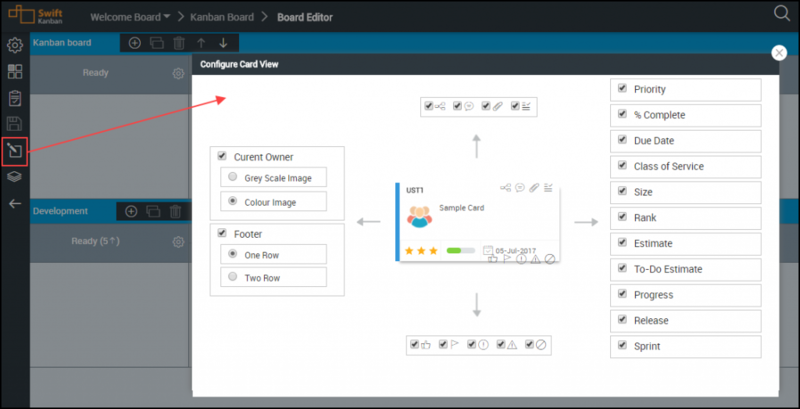 Go to the Card Designer view on your board by navigating to Kanban Board > Board Editor > Card Designer. To view an attribute with its values, select it in the Attributes menu. To hide it, clear the selection. To change the order, just drag the attribute and drop in between the two attributes as you want. Make the changes once the previous change is saved successfully. The sample card gives a preview, which refreshes automatically after every change. The changes are reflected when you return to the board. Note that the default enterprise settings of the card carousel are inherited onto the board. If the board has changed the configuration, the same will reflect, overriding the enterprise settings. For example, if the Admin has hidden the ‘Rank’ for the Enterprise and you still see the attribute on your board, it means that it is not hidden for your board.